Hugh Jackman guts a fish as audiences go wild for him and other stars on Broadway. In an era dominated by superheroes and other non-human factors, stars don’t mean much at the movies these days–if they did, would the likes of Nicolas Cage, John Cusack, and Robert De Niro be turning up in slenderly budgeted VOD obscurities. But they mean a lot on Broadway, where I saw, with my own eyes, Hugh Jackman auction off a sweat-stained T-shirt he had just worn in The River. The first–and only–bid was for $10,000, topping the previous night’s $7,500. Broadway Cares/Equity Fights AIDS soon made $500,000 off those shirts and whatever else Jackman, the entertainer’s entertainer, was giving away during the fall’s donations drive. I admit to thinking the same thing, not because I was ogling Hugh (not much, anyway), but because if I had a different script on hand I might have taken advantage of our proximity and given it to him. Jez Butterworth, who wrote the splendid, sprawling Jerusalem (2011), a three-hour tour-de-force for Mark Rylance, has returned from the West End with a modest chamber piece that casts a self-effacing Jackman as a solitary, taciturn fisherman. “The Man” (yes, it’s that kind of play) reels in “The Woman” (Cush Jumbo), who, after a bit of a chat, seems to disappear, only to be replaced by “The Other Woman” (Laura Donnelly). We fear the worst, but Butterworth (who co-scripted the time-teasing Edge of Tomorrow with his brother John-Henry) plays his cards close to his chest, right to a finish that’s more of a pause, or an anti-climax, and, maybe, a surprise. Though far from the worst intermissionless play I’ve seen (the worst are deadly), The River is among the more frustrating, as if Butterworth couldn’t get a handle of what he wanted to say about the changeless difficulties of relationships, then decided to dramatize the stalemate. Compensations: The women, who do the heavy lifting, are excellent (look for them on the run of New York-produced TV shows any day now), and the rustic environmental staging is nice. Jackman, who is as compelling in silence as he is in song, gives an effectively obsessive performance (the director is Ian Rickson) and guts an actual fish onstage. On some nights he’s accidentally cut himself doing it, and has, stoically, soldiered on, rather than stop the show. The River offers no tears, nor any sweat now, but you may get the star’s blood. The only two Broadway shows to recoup their investment this season are The River and It’s Only a Play, starring the dynamic duo of Nathan Lane and Matthew Broderick, who were the stuff of legend in The Producers (2001)–and less than that in a revival of Neil Simon’s The Odd Couple in 2005, the same year The Producers stiffed as a movie musical. 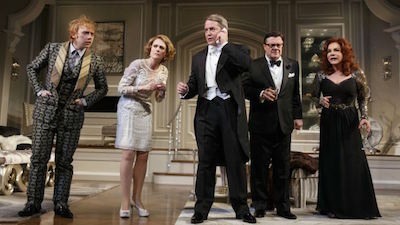 A durable but tarnished brand suffers further damage in a strained “revisal” of a Terrence McNally play that’s been kicking around since 1982, which has been brought up to date with a few Shia LaBeouf jokes. What it needed, however, wasn’t revision–it was cutting, down to one act size. A simple premise is overextended, exhausting a cast that’s blu-chip right down the line. Lane is a TV actor who turned down a play written by his best friend (Broderick), who, as his drunken star (Stockard Channing), pretentious British director (Harry Potter‘s Rupert Grint, in Beetlejuice makeup), and cloying first-time producer (Megan Mullally) apprehensively await a make-or-break New York Times review, maintains a Zen-like calm. An inept coat check boy (newcomer Micah Stock) and a theater critic with aspirations (old lion F. Murray Abraham) join in conspiring to ruffle the playwright’s equilibrium. In what should be the play’s highlight, closing the first act, Lane delivers the news–on and on and on, past the jokes being credible, or, worse, funny. The second act simply wanders, in search of punchlines. The veterans do what veterans must do and enliven weak material as best they can. In this they’re let down by Broderick, a weak Felix in The Odd Couple, and worse here. It’s not a great part, but he does little to pick up the slack with his quavering, recessive performance. Despite The Producers, I’m not sure he and Lane, who knows how to land a laugh even in a Sahara of a production, are such great partners. They are, however, proven hitmakers, and I’m sure they’ll be conjoined for a few more shows until they end their careers in Simon’s The Sunshine Boys. Preparing for the Brooklyn Academy of Music engagement of The Iceman Cometh, Lane leaves It’s Only a Play on Jan. 4, with Martin Short stepping in. That’s the witching hour for a few more stars. Last call that day for Michael Cera, outstanding as a guileless fuckup blundering through New York in the early 80s in an assured Steppenwolf revival of Kenneth Lonergan’s This is Our Youth, also starring Kieran Culkin as his more manipulative sort-of friend and blogger Tavi Gevinson in a fetching debut as an almost-girlfriend. 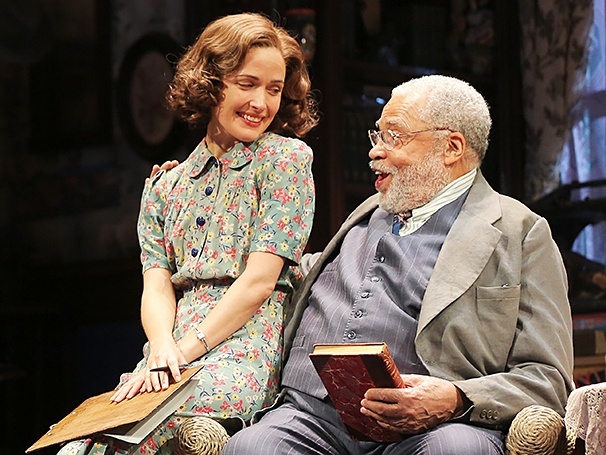 Lonergan’s bracing, off-kilter writing, Anna D. Shapiro’s typically hard-edged direction and the cast combine for a highlight of the season. Name TV and film actors sometimes hit Broadway to right uncertain careers and Cera has managed it well. Finally, I’d like a word with James Earl Jones. In 2005 rumor had it that a revival of On Golden Pond would be his last Broadway show, so I figured I should see one of our finest actors in a treacly show rendered superfluous by a near-flawless film version. He was the only real reason to suffer through it…and then he did three more plays. I could have waited, James. He’s back in a fourth, the Kaufman and Hart comic classic You Can’t Take it With You, which won the Pulitzer Prize and was subsequently 1938’s best picture at the Oscars. He’s clearly having a grand time as the patriarch of a family of high-spirited New York eccentrics that includes Kristine Nielsen, Mark Linn-Baker, and the delightful Annaleigh Ashford, and the fireworks aren’t just metaphoric; there’s real ones onstage, plus the great Julie Halston and Elizabeth Ashley in small, showy roles. (And Rose Byrne as the family’s sanest member.) This one you should see…and James, as you turn 84 next month, here’s hoping you have several more plays in you.